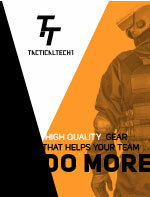 TacticalTECH1 is a division of RescueTECH1, Inc. Our purpose is to provide tactical personnel with the same high quality life safety gear that is required by professional technical rescuers. From Ropes to Harnesses, from Slings to bags, our products are made in the U.S.A. using our exacting quality control and manufacturing standards. RescueTECH1, Inc was founded to provide rescuers with a quality source for Rope Rescue and other Technical Rescue Equipment. We worked hand-in-hand with manufacturers during the developmental years of technical rope rescue and saw a great change in the rescue field. Stronger ropes, rescue grade hardware, harnesses, and slings were developed. Standards, such as NFPA 1983, were written. New rescue techniques provided for simpler and safer rescues. We are proud of our role in the formative years of technical rescue. Over the years, we added many manufacturers to our product line as well as started our own brand names (Rigger, RescueTECH, ACCESS Lifelines, EGRESS Personal Escape Ropes, PROBE Search Lines). During the 80's, 90's and most of the early part of the 00's, we were the largest supplier of Yates, RSI, Blue Water and other prominent rescue equipment to the fire and industrial rescue market. We found, however, as we grew, some manufacturers could not maintain our required level of performance or product enhancements. So, we started building much of our own equipment. And, in production areas where we new others could meet our needs, we partnered with some of the leading manufacturers to produce our products, our way. Our facilities have grown from a small 1,000 square foot office / warehouse to a 12,000 square foot office, warehouse, and manufacturing facility that we built in the Summer of 2000. Since that date, we have continued to add warehouse, production and testing floorspace to our facility. In 2008 we added 3,000 sq ft. of additional warehouse space to handle the ever-growing amount of inventory that we stock. We own our facility and we have another 3 acres of land on which to expand our operations. RescueTECH1, Inc is a Manufacturer and Stocking Distributor of the products we sell. We currently maintain one of the largest inventory of technical rescue equipment in order to serve our customers faster than our competition. Since 2000, we have expanded our production facility to allow us to manufacture more complex bags and harnesses. In 2005, we designed and introduced our ACCESS lifelines and prusik cords and our VANGUARD Rope Rescue Harness. In 2006 we introduced the Ruth Lee Training Manikins and an extensive line of sewn rescue equipment packs and bags. We continue to increase our manufactured product line to help us maintain the quality of the products and service we offer to rescuers. Our personnel have extensive experience in rope manufacturing, rescue, and fire operations. With over 35 years of total experience in the manufacturing of Life Safety Products, our senior production staff is uniquely qualified to design and manufacture the highest quality products. Our continuing participation in the development of standards and rescue equipment gives RescueTECH1, Inc a unique opportunity to provide our customers and clients with the optimum selection of rescue equipment. Rescue Technology maintains certification to ISO 9001-2008. After a year of development, documentation and self-audits, SGS approved our system and certified Rescue Technology's Management and Quality system to be compliant with ISO 9001-2008 standards. In the Fall of 2008 we were recertified by SGS to ISO 9001-2008 quality control standards.